I was asked about moments in my life that made me say “WOW”. That got me thinking. When I first started writing them down I came up with 7 things. That can’t be right. I know I am boring and uninteresting, but still, 7 events, really??? So, I slept on it and began again. This time starting from the beginning and thinking about things I have learned, been through, touched my heart and have seen. Some things are not that exciting but when you are living in that moment, it can have that “WOW” factor. Getting glasses at the age of nine and still needing them. Going to a small Christian school as a teenager. A day trip to Kentucky with my Grandpa D.
Any Christmas at Grandma S.
My dad having a heart attack while on his job. Having someone total my car while it set in the driveway and me sleeping. Hit and run. My mom falling down a flight of cement steps…..it about killed her. While on vacation seeing the Water Gardens in Texas, absolutely beautiful. This journey I am on right now. Every time someone says “I love you” to me. 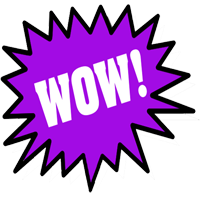 Tell me some of your “WOW” moments. Categories: Just Because, My life | Tags: Being Grateful, finding joy, Happiness, my life, simple things, WOW | Permalink. The small wows are really the big memorable wows after all! Yes, I really thing the little “wow’s” deserve there time in the lime light. Sometime the little wows are our biggest memories. Thanks for commenting. Love talking to my readers.